WBO Light Heavyweight World Champion Sergey “Krusher” Kovalev (32-2-1, 28 KOs) and Eleider “Storm” Alvarez (23-0, 11 KOs) addressed the media at Hard Rock Café in Times Square to officially announce their upcoming “Super Men” showdown at the brand new Hard Rock Hotel & Casino Atlantic City, on Saturday, August 4 televised live on HBO World Championship Boxing®. Kathy Duva – CEO, Main Events: “Welcome to the fabulous Hard Rock Café in Times Square. 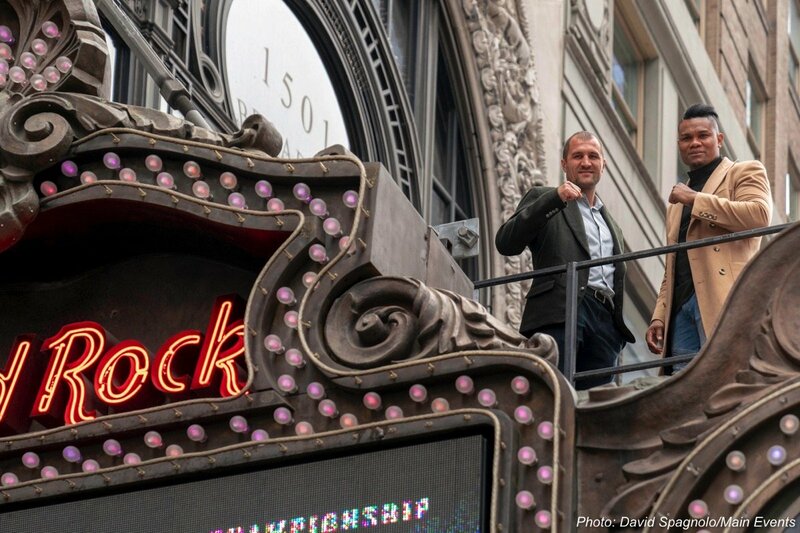 We’re delighted to announce today that the WBO World Light Heavyweight Champion, Sergey Kovalev, will face undefeated number one contender, Eleider Alvarez, in an HBO World Championship Boxing event at the brand new, soon to open, Hard Rock Hotel & Casino in Atlantic City on Saturday, August 4th. The TV bouts start at 10 p.m. The event will be promoted by Main Events and Krusher Promotions, in association with Groupe Yvon Michel. “Ever since Sergey and Bernard Hopkins drew a million-dollar gate to unify the light heavyweight titles in November of 2014, at the last major boxing event to take place in Atlantic City, we at Main Events have been itching to find a way back to the place where we promoted so many big events and spent so much of our lives. While this city has dealt with the same challenges that have bedeviled most of the world economy during the last decade, the arrival of the iconic Hard Rock brand heralds a new beginning that I believe will lead to the re-birth of a streamlined, modernized and revitalized destination resort. “And so, with my dear friend, Bernie Dillon, who I have known and worked with many times since we were all starting out our careers in the early ’80s … When he called and asked me if Main Events could help him bring big time boxing back to Atlantic City in his new role as the V.P. of Entertainment at Hard Rock Hotel & Casino Atlantic City, I was delighted to be able to tell him that I had just the thing he was looking for. 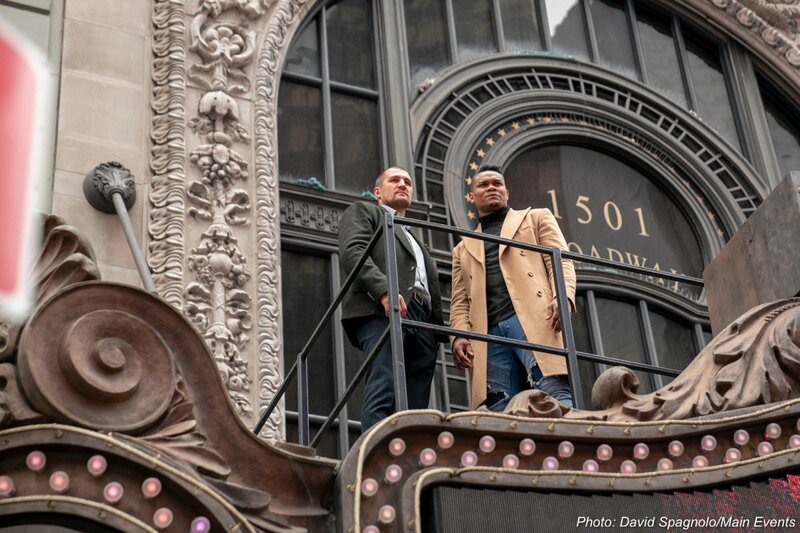 “Sergey participated in the last big fight on the Boardwalk, and how fitting it is that he would be in a position to bring HBO back to Atlantic City and kickoff the next chapter of the city’s boxing history. “And speaking of history, I am pleased and still a little amazed to be able to mark a big milestone in the story of Main Events today. In May of 1978, my late husband, Dan Duva, incorporated Main Events. So, this month we celebrate our 40th anniversary and I can’t think of a better place to mark that occasion than here today among so many friends. “During the last 40 years, we have had the privilege to promote many hundreds of events. A lot of those big events took place in Atlantic City. Holyfield-Foreman, Pazienza-Camacho, Gatti-Ward II and III, Gatti-Mayweather and Kovalev-Hopkins come to mind immediately. There are a lot of others. Lennox Lewis, Evander Holyfield, Meldrick Taylor, Pernell Whitaker … All the great fighters we worked with. I think even Fernando Vargas once or twice fought in Atlantic City. “So, let’s move on to the future now, and talk about what we have in store for you on August 4th. Supermen. Krusher and Storm. Sounds like a couple of superheroes, right? Today Sergey sits at the top of the light heavyweight division. Alvarez, the long-time number one contender in the division finally gets his shot at the title when they share the ring on August 4th. “They, of course, have something else in common besides their date in August. Both have been avoided a lot by the same guy and so, tired of waiting for that guy to step up and face them, despite multiple attempts to put those fights together as Yvon can well attest, they have decided to simply fight each other. And we think it is most fitting to declare that they are the true supermen. “As for our co-feature, that fight is still being made and will be announced separately. It will most likely be that dynamic young WBA Light Heavyweight Champion Dmitry Bivol will defend his title. Rhonda Utley-Herring – Deputy Commissioner, New Jersey State Athletic Control Board: “Thank you, Kathy, for that introduction. Good afternoon, everyone. On behalf of Commissioner Larry Hazzard, I’d like to extend his apologies for not being here today, as he’s attending his granddaughter’s graduation from college at Hampton University. “Nonetheless he, as well as the rest of us at the New Jersey State Athletic Control Board, would like to extend a very warm welcome home to Kathy Duva and the Main Events family as you kick off the resurgence of Atlantic City casinos’ partnerships with major boxing events. “For those of us who were around in the early ’80s for the initial rise of casino gambling and professional boxing and all that it brought to the Jersey Shore, you may agree that it’s very fitting that Main Events … which, by the way, is one of New Jersey’s founding fathers of boxing promotions … is at the forefront, making history once again with the first major boxing event opening the Hard Rock Hotel & Casino in Atlantic City this summer. “The SACB is very pleased to welcome back casino executive veterans James Allen and Bernie Dillon who were also at the center of the action during some of the most competitive and great boxing matches held in Atlantic City. We sincerely thank you for your interest in New Jersey as a major boxing venue, and we look forward to what we hope is the first of many, many exciting combat sports promotions at the Hard Rock Hotel & Casino in Atlantic City. Duva: “Thank you, Rhonda. I a sense of theme here. This is like we’re all coming home. “Now I would like to acknowledge our television partner, HBO, Peter Nelson, Jonathan Galst, Ray Stallone and all the many wonderful people that work there. During those 40 years, it seems that so many of the memories were made with that HBO logo in the background, and Jim Lampley’s voice ringing in my ear. 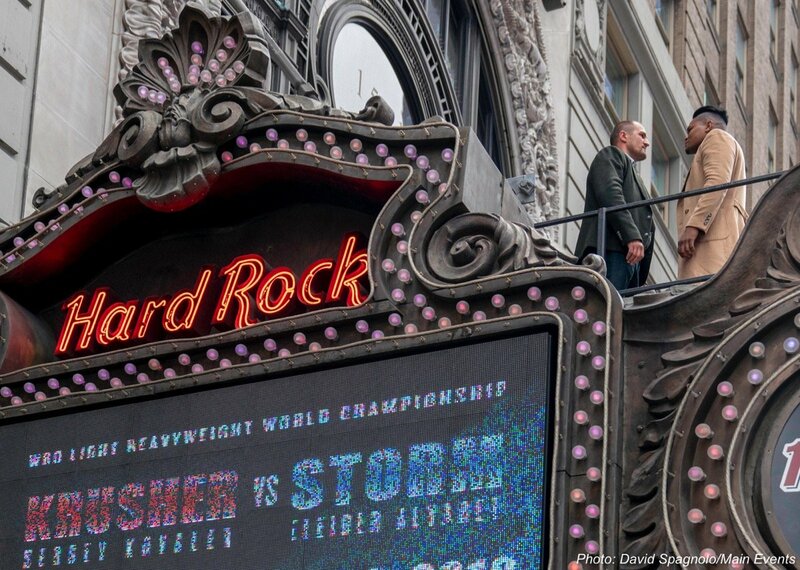 I am so happy to be able to stand here today, 40 years into this crazy ride, and say that Main Events’ relationship with boxing’s number one network is still as strong as ever. We have made so many stars with you, HBO, over the years, and we look forward to making many more in the future. “On to our host. On to Bernie Dillon. If you had told me back in 1983, when Vinny Pazienza fought on the undercard of a fight between Thomas Hearns and Murray Sutherland, that when I first met Bernie Dillon when he worked at the host hotel at that time, that we’d be standing here today in these roles, doing these big jobs, I would’ve had a lot of trouble envisioning it. Bernie’s been involved with boxing throughout most of his career in his various positions at Caesar’s Atlantic City, Trump Plaza, the Taj, HBO, Hard Rock in Ft. Lauderdale, the Revel, and now at the Hard Rock in Atlantic City. “Bernie told me that when he left Atlantic City to work for a cruise line a few years ago, he thought that he had finally left boxing behind. But, Bernie, we don’t let anyone get away that easily. I am so glad to welcome you back, and I can’t think of anyone better positioned to help resurrect big time boxing in our state because you are one of us, and you always have been. Bernie Dillon – VP of Entertainment, Hard Rock Hotel & Casino Atlantic City: “Thank you, Kathy. It’s great to be here. I want to thank our sister Hard Rock Café New York here in Times Square for hosting this event today. And it’s great to be back in Atlantic City and I hope that each and every one of you will be able to make the trek to our new property on the Boardwalk. It’s very special. It is going to be … It is a resurrection. It’s a transformation. Hard Rock is investing $500 million to make the property something the Boardwalk and the entire city has never seen before. It is a destination in itself. “We will have a completely revamped arena. You remember the old Etess Arena. We are keeping the name. Etess Arena is very special to a lot of us. Mark Etess would be happy, and I’m sure he’s watching us right now. But it used to have a capacity of 5,000 people. We have created the opportunity to increase that capacity up to 6,000 for boxing. There is not a bad seat in the house. If you remember from the events we’ve done there in the past, it’s a great room. It can create the electricity that certainly boxing deserves and I know it’ll play well for HBO as well. “The property itself, 2,000 rooms. It will have 125 table games, 2,100 slot machines, over 20 bars and restaurants throughout the facility. Like I was talking about the Etess Arena, we also have the Sound Wave, which is a theater. It has a capacity of 2,000 people which will be doing over 200 nights of programming a year. The Arena will have over 80 nights of programming a year, which is unprecedented in Atlantic City. “We’ll also have five other live entertainment facilities on property. Any time, 365 days a year, we will be presenting live entertainment on an ongoing basis. Just a great, great, electricity that we will be creating. Hard Rock brand is all about music, and add to that comedy, add to that boxing, and I think you’ll just find it entertaining any time you come. “Our grand opening will be on June 28th. June 29th, we just announced yesterday that we have Carrie Underwood performing, a super country star. And then we have Pitbull the next night. As it’s been told to me, you can’t start the party without Pitbull. Great lineup throughout the rest of the summer, including … I’ll just mention a few which we have. We have Florida Georgia Line for two nights. We have Maroon 5 coming in. Rascal Flatts. Frankie Valli and the Four Seasons, an old time Atlantic City favorite. We also have STP and Colt. We have Counting Crows. We have Blake Shelton. We have Toby Keith. Amy Schumer. Kid Rock for a couple nights. Steely Dan. I mean, we really cover a whole gamut across the entertainment scene, and I’m sure this property will be shining in the months to come. “We could not be happier than to be a part of this promotion. 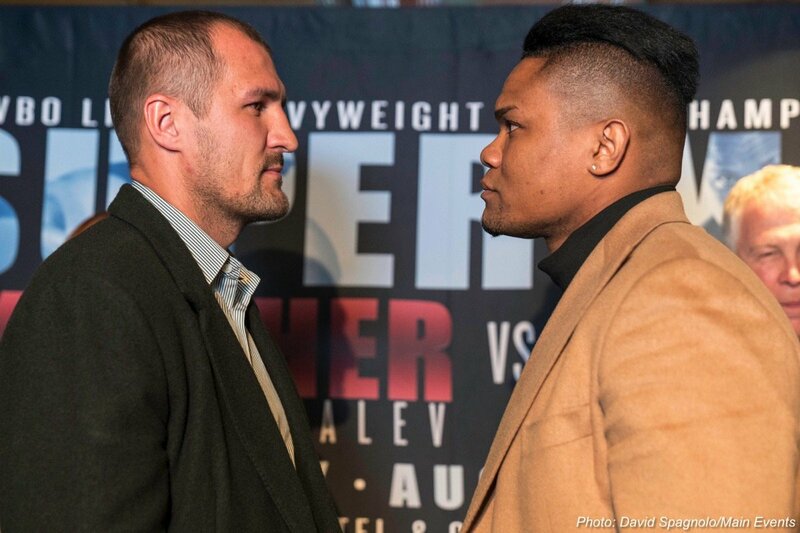 The fight itself certainly with Mr. Kovalev and Mr. Alvarez. We are excited, and may the best man win. We know we’ll have a great promotion and look forward to working with you guys. It’ll be our pleasure to host you. 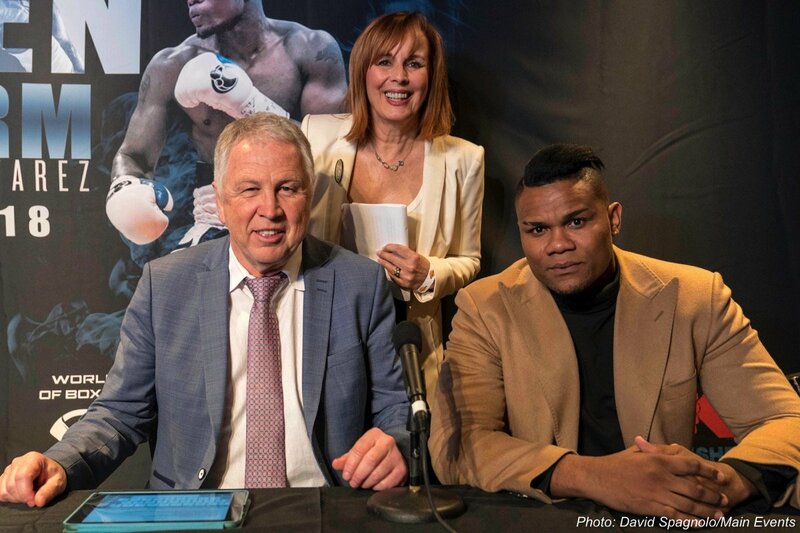 “Working again with Kathy Duva and Main Events … Like Kathy was saying before, her and her husband, Dan, we had a lot of great promotions together back in the ’80s and the ’90s, and I’m sure that this event will go a long way in helping restore boxing to its heyday like it was before. “The Etess Arena, like I was talking about before, has a rich history in boxing already. I just want to read to you a few of the names that have performed there in the past. Starting off with Thomas Hearns, Michael Moorer, George Foreman, Roy Jones, Jr., Vinny Pazienza, Roberto Duran, Hector Camacho, Arturo Gatti and Buster Douglas, just to name a few. There were many more and I could go on and on about it. But, again, it’s a great room for boxing, and not a bad seat in the house. “With that said, in our commitment to making this event work, making boxing work, back in Atlantic City, our ticket prices are very fairly scaled. We’re not trying to go out and charge what we probably could for this show. Ringside seats are topping out at $200. More than half the house — 3,500 seats — are priced $100 or less: 1,500 tickets at $100 and 2,000 tickets at $50. So hopefully boxing fans will respond. I’m sure they will. And in our estimation, a very affordable rate for such a great event like we’re putting on August 4th. Duva: “You know, Bernie just made me realize Mark Etess is definitely up there watching us along with Dan, and they’re both scratching their heads like … Kathy and Bernie are running this thing? How the hell is that? Who would have known? They would be telling us everything to do. But, you know, we learned from the best, and that’s why we know what to do. “So, let’s move on to the fight. That’s why we’re all here. 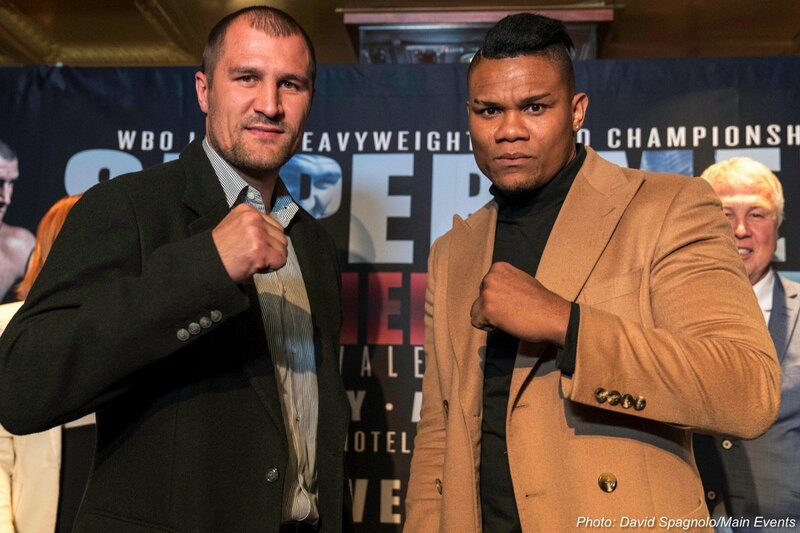 When I called Yvon Michel a few weeks ago to ask if Eleider Alvarez might possibly want to be interested in challenging Sergey Kovalev, he sounded very happy. And he asked me to give him a couple of days. A couple of days later, he called back and we had a deal. I sent him the contract a couple days after that and found it signed in my email queue the next morning. “I tell that story to illustrate two points: 1. The relationship between Yvon and Kathy is not the reason that a certain fight hasn’t happened. Yvon is a good promoter and when left unfettered to do his job, he gets it done in a most professional manner. 2. When fighters really want to fight, making the fights that you, the fans, want to see is easy. And we have two fighters here who want to fight. This is the way it’s supposed to be. “When I used to ride down the Parkway in my father’s Oldsmobile Vista Cruiser as a child during our annual trek to the Jersey Shore for our vacation during the first two weeks of August, I used to wonder why there were always so many license plates from Quebec. Well, I learned why just a few weeks ago. Every year, during late July or early August, thousands of contractors from Quebec travel to the Jersey Shore for their vacations. And so, it seems that much of Montreal will be within a short drive of Atlantic City on August 4th, enjoying their Contractors’ Holiday, which apparently is a big deal and none of us in New Jersey knew about it. Yvon Michel – President & General Manager, Groupe Yvon Michel: “Thank you very much, Kathy. You can’t imagine how excited we are to be here today. There’s one person more excited than me, Eleider Alvarez. Thank you very much for being here. Thank you very much, Kathy, for this important opportunity. It was unexpected, really. We were fighting hard to have another world championship opportunity, but that will fall at the right time, at the right place. The way you have handled our negotiation … really, really it was professional. We’re very, very pleased how it turned out. “Thank you very much, Sergey ‘Krusher’ for giving us the opportunity. Thank you, HBO, also Peter Nelson for bringing that fight there. “Kathy is right. The last week of July and the first week of August, it’s by legislation in Quebec. It’s the law. It’s Construction Holiday. And used to be, not that long ago, why Atlantic City was the main place for Quebecers to go for their vacation. And I’m telling you, we have received a lot of calls and it has been announced only a couple days ago. 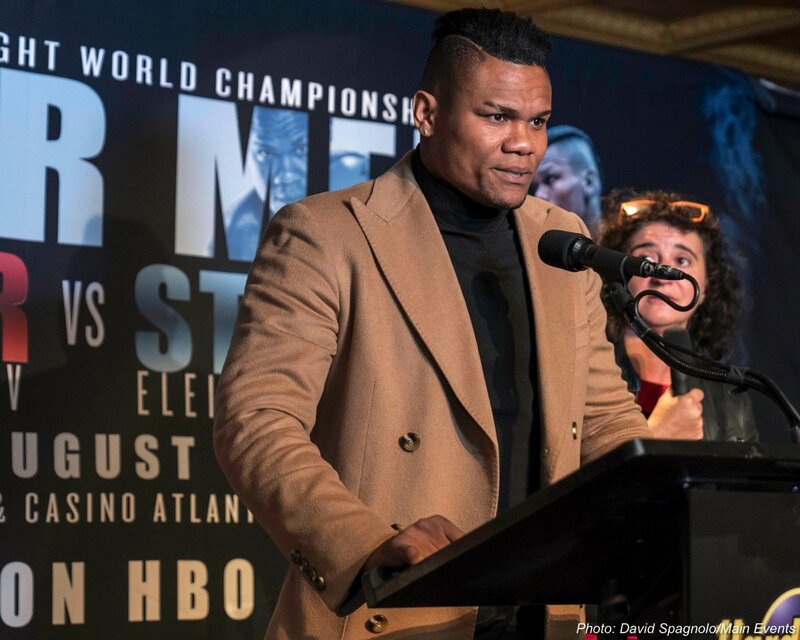 We have received a lot of calls and there will be buses that are going to be just to go to Atlantic City for this weekend, because Eleider Alvarez has a lot of fans. He’s very liked, very loved in Quebec. And there will be a lot of people that are going to come. “Again, thanks to Main Events, but like Kathy was saying, it was when Gatti was fighting in Atlantic City, we were bringing Quebec and a lot of people over there. And when Mr. Dillon called Kathy and asked her if she had a good event for you, you can’t imagine how good it will be. I’m telling you, it’s good. It will be exceptional. And you said 6,000 seats, and I’m sure it will be sold out pretty quick. “Eleider Alvarez is an undefeated, 23-0, 11 KOs. He’s pro since 2009. He resides and lives and trains in Montreal. He’s married but his family they still reside in Colombia. He’s 34 years old. He’s been number one contender since 2015. He’s a former amateur star. He had participated in the Olympic Games in Beijing. He won a gold medal in the Pan Am Games in Rio in 2007. “He is one of the few fighters in America who holds a winning record against Cubans. Even he has three wins against the current gold medalist of the last Olympic Games, Julio Cesar La Cruz. He is rated by Ring Magazine for 218 months. So over four years, he’s been rated in the top ten … the best contender in the world. He fought on his way up, he beat Edison Miranda and Alexander Johnson. He traveled in Monaco to defeat Ryno Liebenberg, where he got his Silver Belt. He traveled in Chicago to beat Anatoliy Dudchenko. He fought and beat Isaac Chilemba to become the mandatory contender in Quebec City in November 2015. “Since then, even if the timing was not there, he did not have the opportunity to fight against Adonis Stevenson for the title, he was very active. He fought four times. We took that opportunity to raise his value to bring his confidence higher, and he beat two former stars in Quebec. He knocked out Lucian Bute in the fifth round. And remember, Bute was just fresh from a draw that has been reversed since then, but a draw against Badou Jack. And he beat also, soundly Jean Pascal. So, it was his last fight. And he was supposed after that last fight, he was supposed to fight Superman. “By the way, I’m pretty sure he will be happy to see Superman. And I’m convinced also that Superman will be there to watch that fight, because Eleider will be there also next week to watch his fight against Badou Jack. “So, I’m telling you, Eleider Alvarez is the number one, is the best contender in the world. And I know that we got that fight because another fight fell apart, but I’m telling you Eleider Alvarez would not have been a 50/50 fight against Marcus Brown. He has more experience. He is a man who has more maturity. And I’m convinced he would beat any contender in the world. 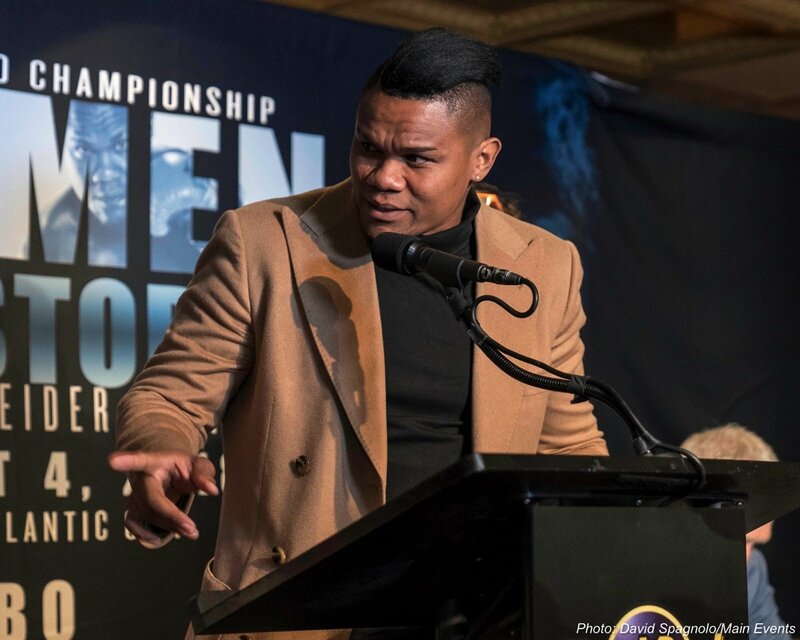 I’m also convinced, looking at all the fighters, the four champions have fought, I’m convinced Eleider Alvarez would have won against all of them. And I’m really, really convinced of that. “So, when you get the fighter who has a lot of talent, great speed, a great environment, excellent training with Marc Ramsay and an excellent management team with Stèphane Lèpine. I’m telling you he’s also excited, fully vindicated. He trained and lived in Montreal and his family still in Colombia, because he still wants to focus on his career. But he plans to bring them back in Montreal very soon. So, he is hungry, determined, a dangerous contender and August the 4th, with all due respect, he will be the new WBO Light Heavyweight Champion of the World. Thank you very much. Eleider “Storm” Alvarez: “Good afternoon, everybody. First of all, I would like to thank Yvon Michel, Stèphane Lèpine who’s not here currently, Main Events, Kathy Duva, HBO and Sergey Kovalev for this opportunity. I feel really overwhelmed. It’s my first press conference outside of my country. “I want to speak a little bit about myself. The first time that they offered me to fight against Sergey Kovalev, I didn’t think about it too much, and I said, at once, yes. Because everybody knows I’ve been three years waiting for Stevenson for the world championship. I have this kind of opportunity and I wanted to take advantage of it at once. It’s the same thing; it’s a world championship. But the importance of this fight is the man that I’m facing. The man that I’m going to be fighting with. He’s the best in the category of the 175 pounds. And after I took the position to fight as a professional boxer, I wanted to face the best ones. Sergey Kovalev is one of the best ones. For this sport of ours, you’re going to know more about who Eleider Alvarez is. “Many know me from BoxRec because I didn’t have before to have the fight of such importance as the one that I’m going to have on the 4th of August. It’s going to be a chance for me to show what I have and everything I went through throughout my career. The next 4th of August, WBO’s going to have our next champion, and it’s going to be Eleider Alvarez. Duva: “Thank you, Yvon and Eleider. Now on to the champion. Last night, you, the boxing writers, honored Egis Klimas as your Manager of the Year for the second year in a row. “When I met Egis six years ago, right here in a restaurant down the street in Times Square, he was managing fighters as a hobby. As I look at the outstanding group of fighters whose careers he now guides, I have to wonder how many more times you’re going to have to give him that award. You will probably have to retire it at some point. Egis Klimas – Manager, Sergey Kovalev: “Thank you very much, Kathy. Thank you very much, writers who saw me working, doing job … and by the way, it still is a hobby. Still is. And I just say, ‘Simple. If you cut my finger on my hand, no matter which one you’re going to cut, it’s going to still the same pain.’ So, all of my fighters I would say are treat same. I look at them and they are same to me. 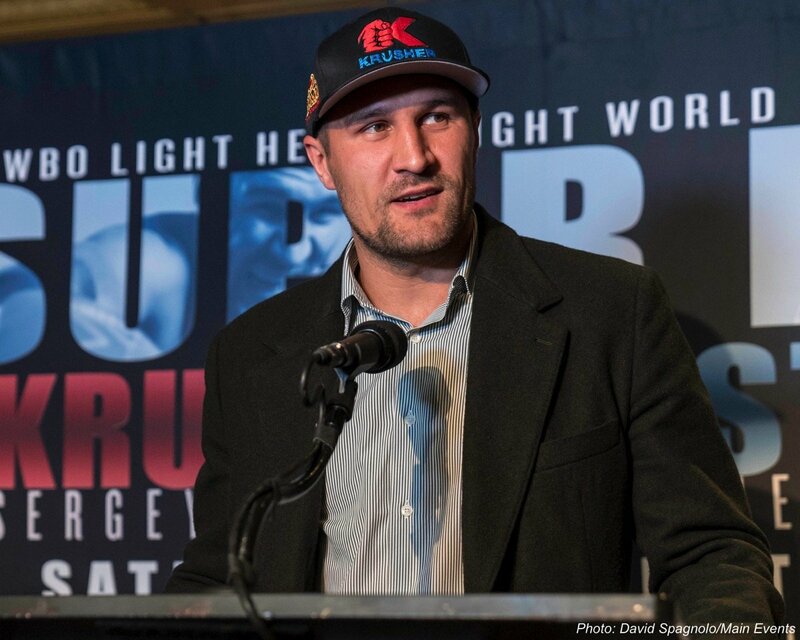 “As far as Sergey Kovalev, we went with him through the long road, I would say. And I wanted to say to the fighters who are starting today, or who started a year ago, Sergey Kovalev opened a lot of doors to new fighters from Russia, from Ukraine, from all over the former Soviet Union, because everyone was looking up to him. And when we started, nobody knew much about the Russian fighters and he was very patient. And I was also very patient, too. So, we went a very, very long run. “Before I met Kathy Duva, I had to manage, promote, do everything for Sergey, and we went through 18 fights. He was 18-0 when I brought him here. Sergey played the big, big role into my management career and I wanted to thank him personally. That the trophy I got yesterday, it wouldn’t be without Sergey. So, he played a big role. “As far as August 4th, I think we got outside of the champions, we got the best opponent is available today in the light heavyweight division. I was actually even surprised that Alvarez agreed to fight, because he gave away his mandatory position to fight a WBC and he choose to fight Sergey. So, it’s a lot of respect for that. Duva: “Thank you, Egis. Also, I want to acknowledge Sergey’s trainer, Abror Tursunpulatov, who is not still here. He’s got some guys fighting tonight on the undercard, but he’s played a big role in the second half of Sergey’s career. “Sergey is making, by the way, his 14th appearance on HBO on August 4th, and this will be his 14th world title fight. He is what I would call a real champion. He has traveled throughout the world, challenging his opponents in their own hometown, many times. He has taken on every challenge that has been offered to him without a moment’s hesitation. He has reached the point in his career where we get to see how real champions cement their legacies. I don’t believe … and, again, we’ll go back to my 40 years … I saw Marvin Hagler. I saw Ray Leonard. I saw Muhammed Ali. I saw every great fighter, really of this last 40-50 years, and you know very few of them didn’t suffer a loss. “When you come down to it, a career is not measured by the W’s and the L’s on your record. In the end, it’s measured by the richness of the challenges you accept, and the memories you make for the fans along the way. 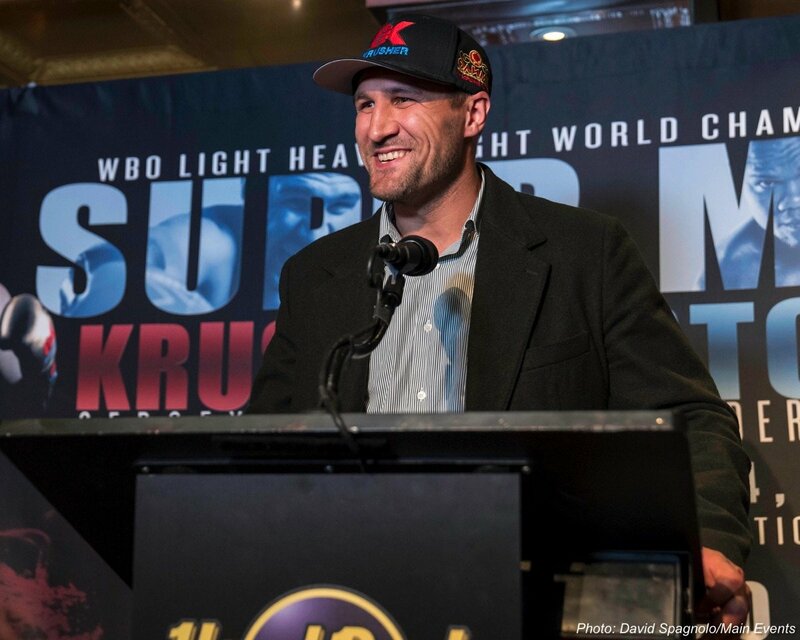 Sergey “Krusher” Kovalev – Two-Time Light Heavyweight World Champion: “Thank you. Thank you very much for everything and I’m happy to be here and back to New York and I’m glad to be here again. “First of all, I want to say thank you to Egis, who one day believed in me and gave me opportunity to be a professional fighter and may my dreams happen for me. And, also, thank you to Kathy Duva who supports us and gave opportunity fighting on HBO. Thanks also to HBO for great opportunity to be in team of HBO boxing. And personal thank you for help to Peter Nelson and Hard Rock for expressing confidence in me. “Thanks to Yvon Michel and Eleider Alvarez for approve the fight. I am sure that we will show really great fight August 4th because I have a plan to defend my title. He has a plan to get a title and to be champion. It will be very big battle and we must be ready and be the best shape of our boxing career. Because in the future, happening huge fights, unification fights, I hope. “Thank you to all the writers. To the writers who gave award that Egis best manager in the world, Lomachenko was the best fighter in the world, and his father, Anatoly, won the best trainer in the world. Duva: “Thank you, Sergey. I want to leave you with a couple of final thoughts: 1. Many of you have been asking me lately about Ellen. You haven’t seen Ellen Haley lately. Some of you met Ellen when she was by Evander Holyfield’s side. Others of you met her later in her career with Main Events. I just wanted to let you all know she hasn’t been around lately. She is going through a very difficult time. Her brother is desperately ill. Her nephew, Jeffrey, who many of you know, also just had very serious surgery. You know, Ellen is not a mother, but I think we’ve all, everyone in this room, has been mothered by her at one time or another. So, if you’re thinking about her, this would be a great time to send her a little text and ask her how she’s doing. “2. It was pointed out to me by our matchmaker extraordinaire and Vice President of Operations, Jolene Mizzone, that I should tell you something very important. You should advise your listeners and your readers to make sure they show up in time to see the undercard. The reason why really says a lot about the way our sport evolves and surprises. “Almost 26 years ago, to this day, May 15, 1992, Main Events promoted its first ever boxing event at the Mark Etess Arena. Michael Moorer fought Burt Cooper in one of the most hellacious heavyweight fights that I have ever personally seen. It was a great card overall, with future champions, Livingstone Bramble and Gerald McClellan featured in the undercard bouts. Can you believe that? But the most important and interesting thing about that night was the guy who won a six-round decision in the first bout of the evening. His name was Arturo Gatti. And it was the first time he ever fought in the city where he cemented his legacy so many years ago. “So, mark your calendars, and be there for all the action. The ticket pricing is spectacular, very similar to the kind of pricing we had when Arturo started his fantastic nine-fight run in Atlantic City. And I wouldn’t be at all surprised if, in addition to watching a terrific main event, you might see a future world champion, or even a legend in the making before the TV fights even get started. “Tickets will go on sale Friday, May 18th, at 10 a.m. and will be available through the Hard Rock Hotel and Casino box office and Ticketmaster. If you can’t be there in person, TV starts at 10 p.m. on HBO. 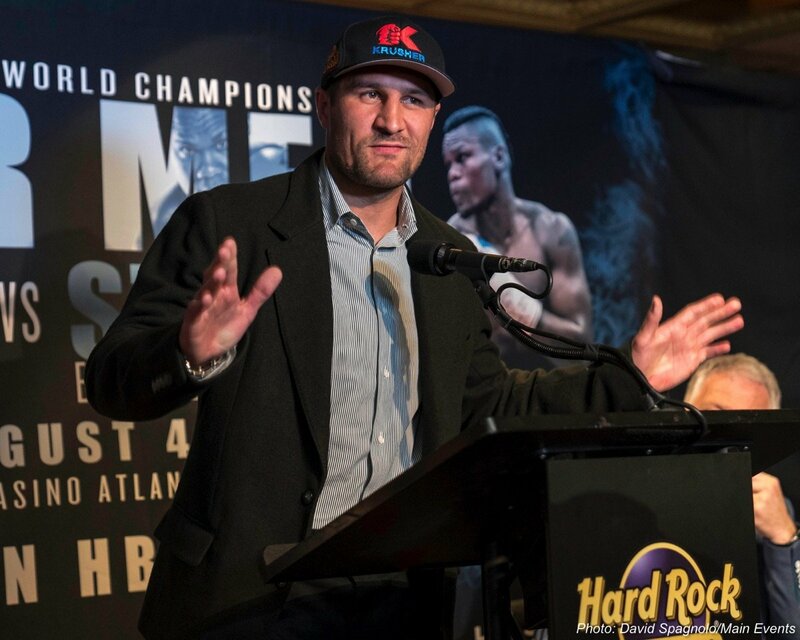 About Kovalev-Alvarez: In the first boxing event at the newly opened Hard Rock Hotel & Casino in Atlantic City, NJ, Sergey “Krusher” Kovalev will defend his WBO Light Heavyweight World Title against undefeated contender Eleider “Storm” Alvarez on Saturday, August 4, 2018. 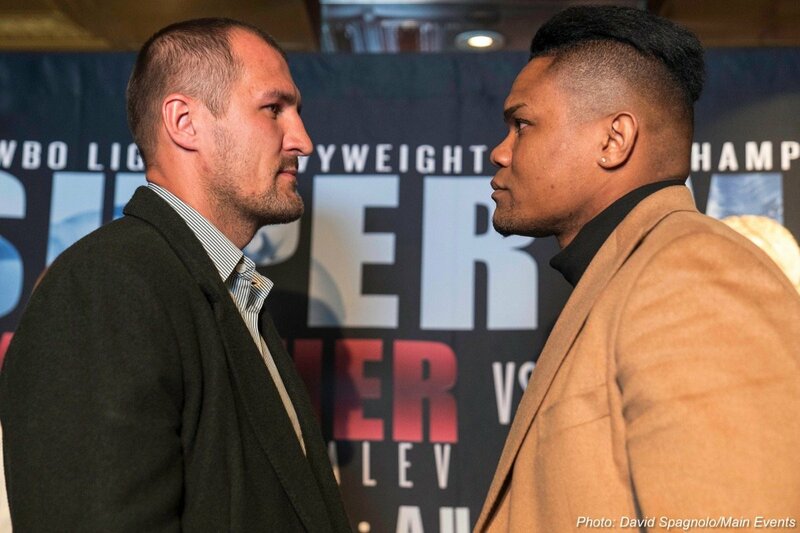 The event is promoted by Main Events and Krusher Promotions in association with Groupe Yvon Michel and will be televised live on HBO World Championship Boxing® beginning at 10:00 p.m. ET/PT. Previous boxing news: Left-Hook Lounge Mailbag: Lomachenko, P4P List, & Bradley v Broner!